Click on the Download Here link above to print out a cute gift note that you can give your gift recipient before their first Kidstir Kids Cooking Kit arrives. 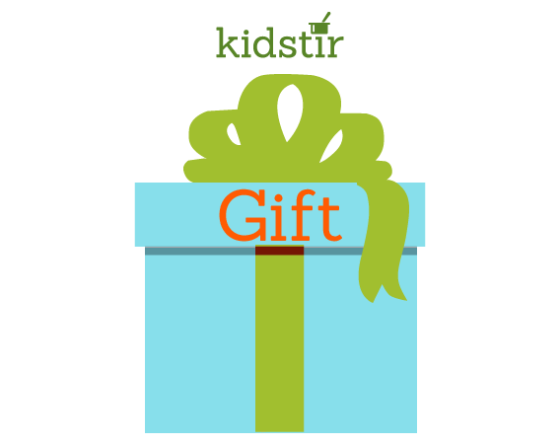 You can learn more about what to expect in your gift by reading the Kids Cooking Kit gift reviews about Kidstir from Food Publications and Parenting & Family Publications whose experts and editors love Kidstir. Parents deeply involved in raising kids often turn to top magazines and and online parenting publications for guidance on the best gifts for kids. We’re thrilled about being recommended as a gift many times over! While you’ve got giving on your mind, you might also consider making a homemade gift for your kids teachers. Check out some of the great recipes you can make with your little chef on our DIY page too. Happy cooking and happy gifting!